Random House Books for Young Readers, 9780375868498, 40pp. Railroad Hank is headed up the mountain in his fine little train to see Granny Bett. She's feeling kind of blue. Along the way, he stops to talk to Missy May, Country Carl, Cinnamon Cobbler, and Reel-'Em-In Sam. Each friend offers up something to cheer Granny Bett, but Hank has bigger ideas. By the time he reaches the mountaintop, his train is bursting with crazy cargo! And Granny Bett has a great idea for what to do with it all. 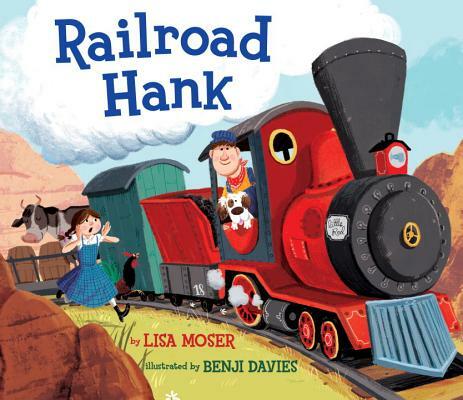 LISA MOSER is the author of "Squirrel's World, " which is on the 2010-2011 Texas Bluebonnet Master List, " The Monster in the Backpack, Watermelon Wishes, Kisses on the Wind, " which received a Oppenheimer Toy Gold Seal, and "Perfect Soup." She lives in Wisconsin with her husband, Marty, and their daughter, Lydia. BENJI DAVIES is an illustrator and animator from London, whose illustrations have appeared in children's books around the world.